This is the world of Thraalion heavily damaged in the long forgotten war between gods and the humanoid races. Now one side of the world is burning under a constant sun, the other side is swept in eternal darkness and ice. Between these two extremes there is an inhabitable area where there is life, running water, forests and glorious kingdoms. This is also the home world to the Thraals. A humanoid race that have the strength of three humans and the size of two. But what they have in strength and size they lack in knowledge and intellect. As in all other worlds the humans turned out to be the most adaptive race of all the seven races created by the Archonts in the beginning of time.The Thraals have slowly been forced to move to the lesser attractive areas of the world. The ones that didn’t move have been enslaved and are now working for the humans as cheap and disposable labor. I’ve had the idea of the world for quite some time, with one side always turned to the sun and the other in constant darkness. Originally I got the idea from an article about the planet Gliese 581 that was found in 2010. Gliese 581 is one of those planets found that is situated in the so called habitable zone around its sun. The interesting thing with Gliese 581 is that it always has one of its sides turned to the sun, just as the world Thraalion. 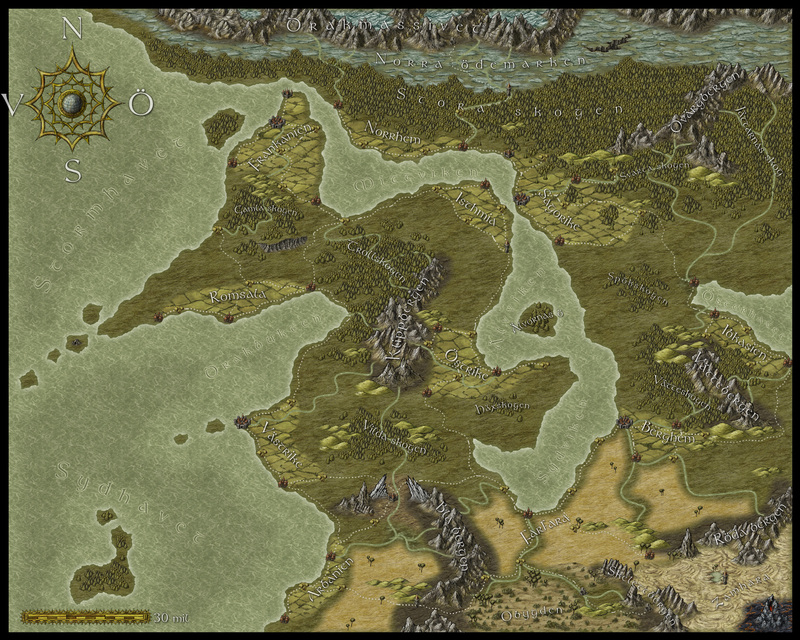 The map is made in CC3 using the 2012 April Annual by Herwin Wielink. This is the second map I’m making using this style. I must say that the style is very easy to use with great graphics. This time I also tried to edit it a bit in Photoshop to see if I could improve the result a bit. I must admit that the difference isn’t that big and the Photoshop step feels quite unnecessary using this style. Still if you want a more painted feeling, as in this map, the Oil paint filter in the Pixel bender add on is the way to go. 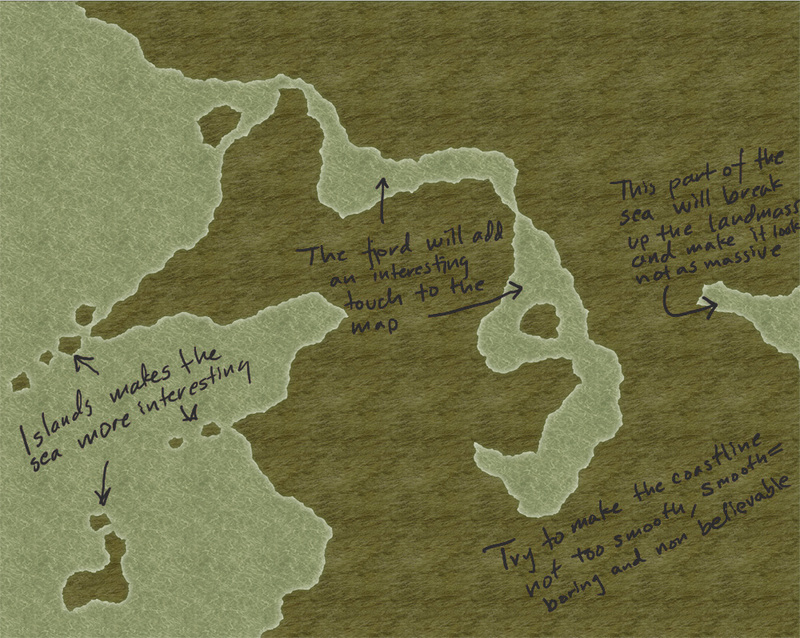 In the map I used a font made by the user Terraformer_Author over at the Profantasy forum. The font is called East Anglia and can be found here. Now it is time to leave CC3 behind and start to do some Colour correction in Photoshop. 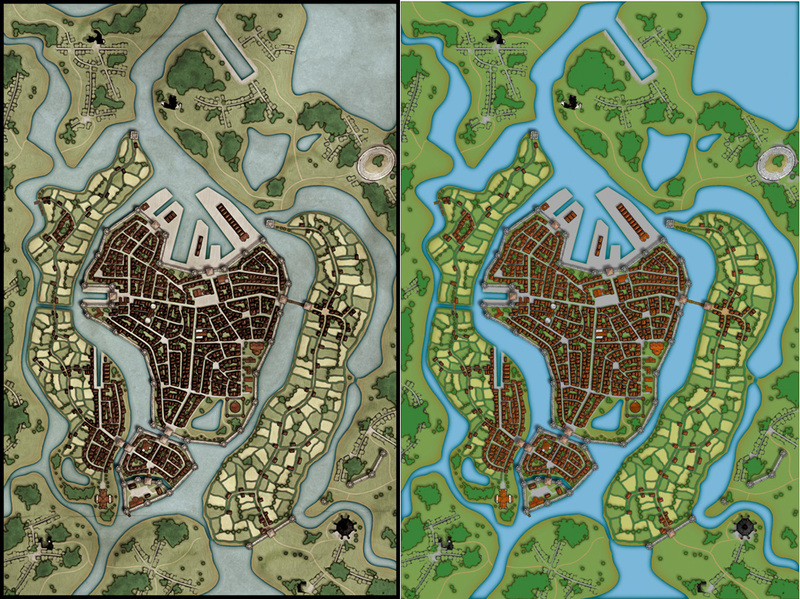 CC3 has a lot of advantages when it comes to making city maps. It is easy to use and you can quickly come up with a very good looking city map. One of the drawbacks however, in my opinion, is that the colour palette used in the included styles are a bit too bright. That is something I usually change by opening up the finished map in Photoshop and applying some filters and effects. This guide is not meant to be cut in stone, it’s more a way to show you how it can be done. You can pick bits and pieces from here and add to your maps. You might feel that some steps are unnecessary or that some are missing. See it more as an inspirational guide. As you can see in the picture above I’ve added eleven layers to the map to get the look and feeling I’m after. First of all I add the layers I’ve marked as 1 and 2. They are for a start purely copies of the background image. 1. On the first layer I apply the Pixel bender filter’s oil paint effect. Pixel bender is a free addon from Adobe that let you apply different effects by using the GPU on your graphics card. This makes it possible to do some really great stuff. With the oil filter the best way of working is just testing your way through the different settings. Don’t worry if the effect comes out a bit strong. You can reduce it later by lowering the opacity of the layer. 2. The oil paint filter has a tendency to blur the image a bit, and we want our map to be clear and sharp. 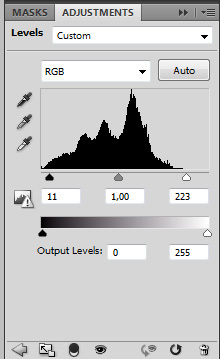 To achieve this I apply the Other/High Pass filter in Photoshop to the second layer. This will make the layer grey and the details light up a bit. You’re looking for a bit of a neon feeling in the picture here. When you have applied the filter change the layer setting from Normal to Overlay. This will sharpen the details in the image that got blurred in the earlier step. Again if you feel that the effect is a bit too strong just lower the opacity of the layer. 3. Now we have a nice and sharp map with a oil paint feeling but we do need some texture to make it look more genuine. For this I’m adding a texture that I’ve downloaded from the Cartographers Guild’s forum. Set the layer of the texture to Multiply. This will darken the image a lot, but don’t worry we fix this in the next step. 4-5. Time to fix the lighting in the map. At the moment the map is way too dark. To change this I add two adjustment layers/Curves. The first one (the fifth layer in the picture just to complicate things) I use to lighten up the whole map. The second one (the fourth layer) is used to darken the waters. Here I’m using the layer mask to apply the effect only to the water areas. 6. Now it is time to reduce the colours of the map to avoid the cartoonish feeling it has at the moment. For this I’m adding a new Adjustment layer/Gradient map that will turn the image into a black and white. I change the opacity setting to 50%. This will let the colours bleed through the layer but the colours will be reduced. You have to try how much you want to reduce the opacity. It depends a bit on what end result you’re after. 7. Next layer is also an Adjustment layer, levels. As you can see I’m very fond of adjustment layers. The big reason for this is that you can easily go back and change the settings or even remove the layer completely if you’re not satisfied with the result. As you can see in the picture above what I do is that I move the white and black arrow into the middle on the graph. This will clear up the picture a bit. Be a bit careful with the settings here or you will over expose the picture which means that you will lose details. 8. Next step is to add some shadows to the forest and land. Add a new layer and fill it with 50% grey. Change the layer settings to Overlay. This will make the grey colour to disappear. Now you select the Burn tool and change the exposure to 15% and start to draw. As you will see youre now creating shadows in the map. I’m using this to make the forest a bit more interesting and alive and to add hills. 9-10. Now we’re nearly done, but the map is at the moment a bit blue (or at least mine is) and I want to change this. To fix this I’m adding yet another adjustment layer, Colour balance. In here you can increase or decrease the colours of the picture, or more correctly if you increase Red you’re decreasing Cyan and so on. When I’m done with the layer I’m still not fully satisfied so I’m adding the adjustment layer/Hue and saturation to the map to decrease the colour a bit more. 11. This layer just includes the black frame around the map. Well that’s about it. The map is done, except labeling, and we now have a map that in my opinion has a much more appealing atmosphear than the one that comes straight from CD3. Below you can see the differense in the map before and after I’ve edited it in Photoshop. As some of you might have noticed some of my posts here on the blog also show up on the Profantasy map making journal blog. 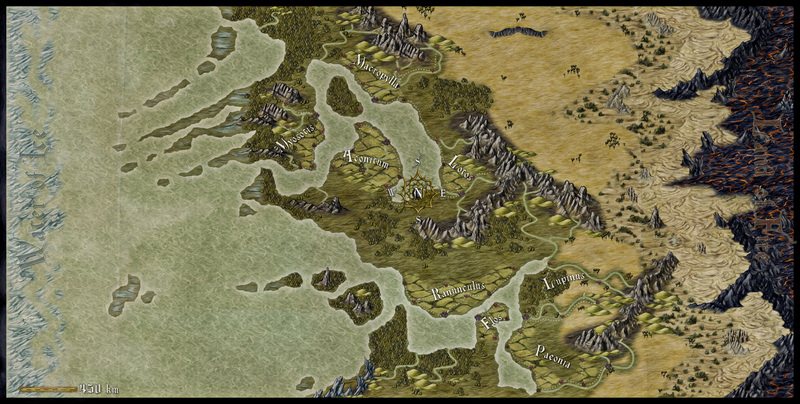 The reason for this is that Simon over at Profantasy asked me if I could cross post my entries here on the blog about mapping using products from Profantasy over on their blog. As I see no harm in this and I thought it could be fun to spread my word to a wider audience I said yes. However everything on this blog wont be cross posted. When I’m writing about mapping with Photoshop or publish maps not done with products from Profantasy they will not be cross posted.